Blown away last evening at the Beamish Mary Inn Folk and Acoustic night by Steve Hicks and Lynn Goulbourn. It was a privilege to be at their show in such convivial surroundings. 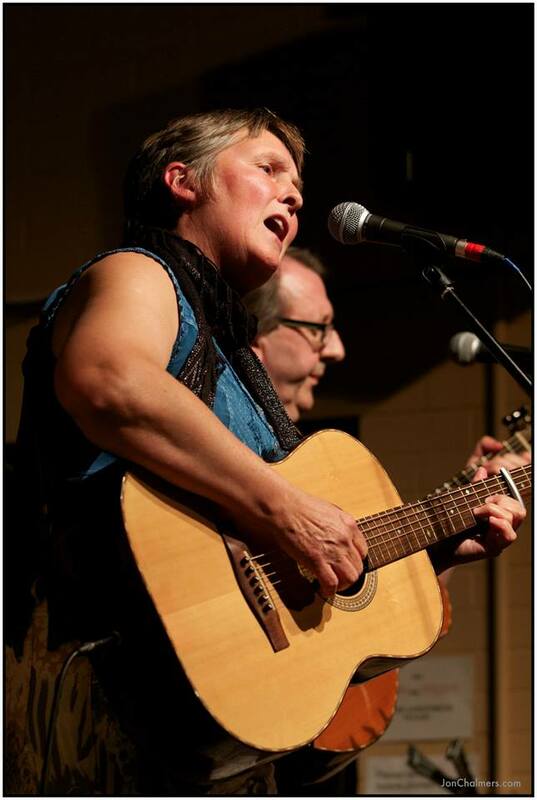 Cracking repertoire from the two of them, some top-drawer original songs and Steve Hicks is easily the outstanding acoustic guitarist regularly working the folk club circuit at the moment. Total musical entertainment not to be missed! Last night at the club we had the long awaited visit of Steve Hicks and Lynn Goulbourn and they were well worth the the wait !!…. what a great night was had by a very appreciative audience who were treated to a virtuoso performance by two of the best artists on the circuit today, Lynn’s soulful vocals and her spot on rhythm guitar playing were complimented by some truly dazzling guitar playing by Steve who is a great singer himself and with an eclectic set covering everything from original folk inspired songs to ragtime / blues to Led Zeppelin-esque classical instrumentals the evening was waaaaaay too short !! Such a brilliant House concert last night – Hick and Goulbourn, played and sang beautifully, to a full house, stalwarts, old friends from other bands, local musicians and local/away punters. Inspiring and collaborative in equal measure. Must be as close as you can get to fine music. Chesterfield Folk Club 14th Feb 2014 (Steve Hicks and Lynn Goulbourn doing support for Kathryn Roberts and Sean Lakeman). Review in Derbyshire Times. Once in a while a night comes along that oozes so much quality that you wish all nights were like this. Fortunately, a large crowd chose to celebrate Valentine’s Day with a feast of acoustic music. The support act was so good that Chesterfield Folk Club immediately began thinking when to bring them back as a headline act. Steve Hicks’ fabulous and varied guitar-playing and Lynn Goulbourn’s accompanying guitar and superb vocals got the evening off to a fine start. We were treated to virtuoso instrumentals and driving traditional English and American tunes. A nod to the date saw My Funny Valentine and Dinner For Two on the list before Steve concluded the night with Stairway To Mozart where we had both modern and classical music injected with rag. Vastly proficient, unassuming and engaging, theirs was a performance to treasure. Kathryn Roberts and Sean Lakeman lived up to their billing as winners of the best duo in the national folk awards in 2012. They gave two varied sets with Kathryn’s remarkable voice backed by guitar, piano, clarinet and flute. The song selection was at once traditional with those driving rhythms that fans of Sean’s brother Seth Lakeman will know and contemporary with Kathryn’s piano-based ballads. It would be hard to choose a favourite from the evening depending on your preferences. The bluesy and rock-influenced approach to Childe Owlet or Whitby Maid contrasted well with the gentle Soft The Morning Sun and the charming 52hz about the lonely whale. A Valentine’s night to remember and Pete Abbott and Gregor Borland to look forward to at Club Chesterfield on March 14. Steve Hicks and Lynn GoulbournSteve Hicks and Lynn Goulbourn came to Cramlington Folk Club this week (30th April 2013), and I’m sure they’ll be invited back again. This modest duo doesn’t need any big promotion – they first came to us as a visiting floor spot, and they absolutely blew us away (apparently they do this quite a bit – their own performance is what gets them bookings).Steve, literally one of the best and versatile guitarists in the world, had us spellbound; his Arrival of the Queen of Sheba was stunning – it sounded like a spinet and a harpsichord combined. His country songs included numbers made famous by Mississippi John Hurt and Reverend Gary Davis.Lynn’s strong, resonant and sweet voice really moved the audience – she ranged from her own compositions (such as Gone are the Cobles), through Northumbrian specials like Bonnie at Morn, to old classics – her final encore was Moon River.As well as their performance being brilliant, they are also very likeable people; they are exceptional performers in their own right, as well as working well with each other, and with the audience, never boastful, though they’ve every right to be proud of what they do.They made an evening pass in an instant, and we all look forward to their next visit. The most appropriate word for these two is this: bewildering. How can they cover so many genres so effortlessly and with such mastery? Whether it’s the fluidity of Steve’s ragtime or the beauty of Lynn’s vocal it’s all done with poise and precision. And fun. Lots of fun. But Gospel, country blues or trad folk, they are right at home with seemingly any style they choose. Too many highlights to list, but the Chet Atkins influenced version of Stairway to Heaven was jaw-droppingly brilliant – and funny. But let’s not forget that Steve’s an accomplished singer and Lynn’s a handy guitarist too. Their strength is probably in the way that they complement each other so well, each supporting the other to produce a sum that is even greater than the prodigious parts. I was favourably taken with this duo’s eponymous (well, nearly) CD which I initially came across around 18 months ago, and the chance to hear its followup was eagerly grasped. I’m not being in the least uncharitable in saying this, but it would seem that things haven’t changed much – musically at any rate – for Steve Hicks and Lynn Goulbourn since that debut disc, for, as I observed at that time, they exhibit a fantastic degree of expertise across a wide field. One important difference between their first record and Owl Café is that for this new offering they are entirely alone in the studio, with only one track (a robustly imagined take on Wayfaring Stranger) employing any overdubbing at all (Steve’s mandolin); for the rest, it’s just one voice, almost always Lynn’s (with a vocal harmony part on two tracks) and one guitar (or two guitars on a couple of tracks) – honing in with complete accuracy and honesty on the pure acoustic sound that is the trademark of their always-impressive live performances. The spread of material on the new disc is also still pretty much representative of the duo’s live repertoire, which may at first glance seem mildly capricious but where an audience can reasonably expect the unexpected – and be highly satisfied with the result in virtually every case, or at very least not be disappointed. The principal difference between the couple’s debut disc and Owl Café in terms of repertoire is that the latter delivers no fewer than seven of Lynn’s self-penned songs, of which more detail below. Refreshingly too, there’s never a feeling that Steve and Lynn are trying too hard to make an impression, for theirs is an easy rolling virtuosity, with individual strong points well catered for in their capable arrangements. Steve’s fingerstyle guitar work is brilliant, immensely assured and versatile yet driven by a sensitivity that’s matched by fun in execution rather than a desire to show off at all costs; and he made all his own guitars too! Lynn’s equally assured and ever-stylish vocal technique can handle almost any kind of song, from blues and spirituals to traditional numbers and her own compositions. The finest of the examples of the latter on this disc is undoubtedly Gone Are The Cobles, which deals poignantly with the demise of the fishing industry off the Northumberland coast; aside from Harry Ridley (paying homage to Lynn’s former art teacher) and Stranger On A Bus, the remainder of Lynn’s songs have an altogether lighter feel, upbeat or positive in tone with settings ranging from soft jazz to genial ragtime. This time round, and perhaps surprisingly so in view of Steve’s accomplished playing, the menu only serves up two brief instrumental items. But the total effect of Owl Café is that of a warmly welcoming, pleasing disc of adept and truthful music-making. Last Monday we were treated to the wonderful Hicks and Goulbourn! They delivered two wonderful sets of songs and the encore was sublime! Quite a few people said that the guitar work was they best of any they’d ever heard at the club. If you run a club and get the chance – book them!! We look forward to you coming again, I did have to leave early, but just caught your performance, it was brilliant. Hicks & Goulbourn were brilliant at Cambridge Folk Club last Friday, and what a pleasure it was to meet them. Hope they come back soon! An incredibly versatile and talented duo! Fantastic finale to the end of the season. Excellent open mic with lots of new talent topped by the superb Lynn Goulbourn and Steve Hicks. I’ve found a new vocal idol after last night! Thank you, you amazing woman! Great evenings entertainment, listening to music I wouldn’t normally go and see. Steve ‘liquid fingers’ Hicks guitar playing was astounding! Your performance was superb, you ‘smashed it’! Such fluidity of singing teamed with Steve’s awesome guitar… Excellent. I have to say Lynn, you and Steve blew me away with your performance, you sound amazing. What a brilliant evening last night! We had an absolutely packed Pavilion room for the first Guest Night of 2011, with 60+ people keen to see Steve Hicks & Lynn Goulbourn. Steve is an amazing guitarist and Lynn is a very accomplished performer too, with a voice that compliments Steve’s brilliant playing. I cannot recall having members of the audience dancing in the isles at the club, but that certainly happened last night! It was as if everyone wanted the evening to never end . . . if you weren’t there, make the effort to see this duo if you get the chance in the future. You won’t regret it! ”It seems there is nothing Steve Hicks cannot do with a guitar. He can play everything from Medieval music or traditional Irish dance tunes to classic ragtime and blues tunes. He can arrange, accompany and make even the most challenging transcriptions sound like they were made to be played on the guitar. He can even build the dammed things! But what I like best is the personality that always comes through in his playing. It’s a pleasure to present the music of Steve Hicks, the best kept guitar secret in Britain”. ‘Steve Hicks is the secret jewel of British guitar playing’. ”Steve Hicks is a leading exponent of fingerstyle guitar. Drawing on an astonishing repertoire that encompasses Classical, Celtic, Ragtime, Blues and Folk styles. He delivers material with technical skill, astute artistic integrity and a natural sense of what it means to entertain”. 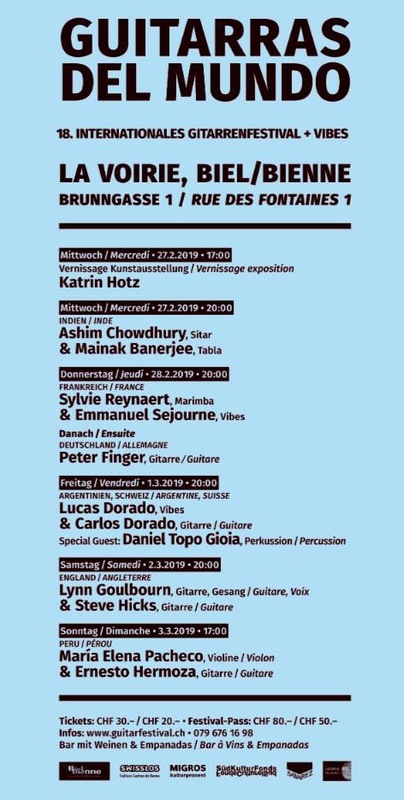 We’ll be playing at The Zoo Studio in Bern on Friday 1st March then the international guitar festival on Saturday 2nd March in Bile/Bienne.